Unbelievable Rates! Walk to the beach and downtown! **Unbelievable rate for this size home!!! A very rare rental opportunity is now presenting itself in York Beach, Maine! You can now reserve the entire Candleshop Inn, once our area's premier Bed and Breakfast, for your private group. The current owners, Barbara and Michael Sheff, have made the hard decision not to operate this historic inn as a Bed and Breakfast, but rather are now interested in offering the entire home exclusively for weekly rental. This beautiful inn features 10 bedrooms (many with private baths) and 7 baths. There are gorgeous ocean views from many of the bedrooms, as well as the front porch. WIFI is featured throughout the house. The large deck is tucked privately in the back with seating for 25 people. The Candleshop Inn is just a short walk to Short Sands Beach in York Beach, Maine. Each of our 10 guest rooms is unique and comfortably decorated, accommodating one to five people in twin, double and/or king beds. Five of our guest rooms offer stunning views of the Atlantic Ocean. In addition to a range of bedding options, we offer rooms with private full baths, 3/4 baths or half baths. In total, the house can comfortably sleep 27 people. 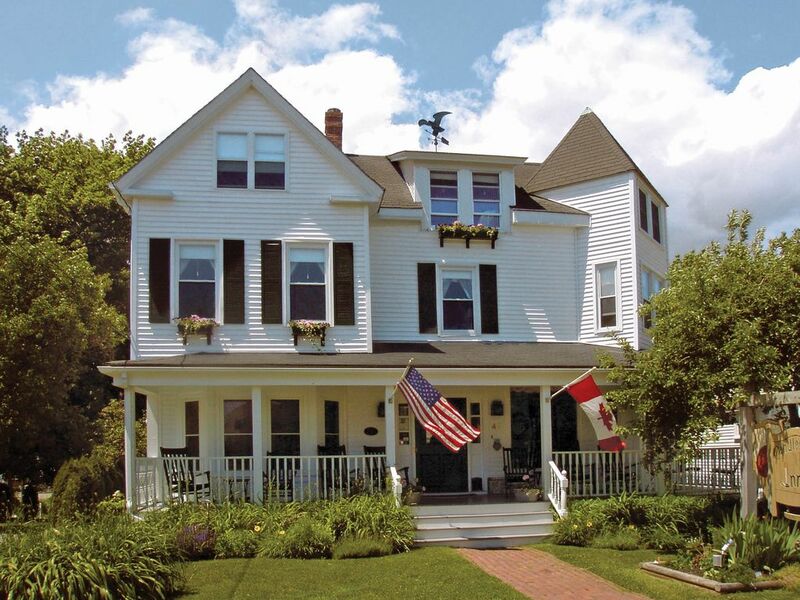 The Candleshop Inn is just a short walk to Short Sands Beach in York Beach, Maine. Consider booking our property for your family reunion, destination wedding, or friends getaway to southern Maine! We offer rooms with private full, 3/4 or half bathrooms, as well as rooms with shared bathrooms. Ocean views from many rooms. Easy 5 minute walk to Short Sands Beach, a great family beach. Or if you want a different beach, take the trolley to Long Sands. All great, clean beaches in York! The Inn is located in the downtown area of York Beach. You are close to shopping, dining, bars and family attractions. See, hear and smell the ocean. We are so close! You can fall asleep at night to the sounds of the waves crashing on the rocks. Drip coffee maker, holds 3 coffee pots. York Beach is truly a family destination in the beautiful southern Maine coast area. The quaint downtown area of York Beach offers seasonal gift shops, restaurants, a family arcade and more ... all within walking distance. It is also a wonderful seaside destination in which to simply come and be in peace at the oceans edge. Lovely rooms and enough bathrooms for a large group! The porch and deck were more than adequate for our group of 19. Linens and towels were nicely appointed and having 2 washers and two dryers was great. The small backup refrigerator was a blessing!! Just a short walk to the beach and town was very convenient. I would recommend this for a large group/family. The house had plenty of room for our large family reunion. So comfortable and so close to the beach! We had a wonderful time at York Beach. The house was perfect for our large family reunion. The kitchen was small but well stocked and had all the conveniences. The back deck fit all of our family so we usually eat outside. So nice! There was still plenty of room inside as well including a small TV room that was enjoyed by the children. The front covered porch with the rocking chairs was perfect for rocking the babies to sleep on and there was still plenty of room for frisbee, blowing bubbles and bike riding. We mostly got carry out meals from the local restaurants in walking distance. Woodys has great pizza, Gaskins had awesome barbecue and There were plenty of other places to grab food. We had a wonderful time and certainly would recommend this house for any large gathering. We all had an amazing week at this beautiful inn. There were 19 of us and this place accommodated all of us perfectly. Everyone had their own rooms which were very clean and comfortable. We enjoyed morning walks to the lighthouse and downtown. Everyone did their own thing during the day and we had dinner together at the inn most evenings. York is so beautiful and has so much to offer. We hope to come back next year. This place is perfect for a large family gathering. Rooms were great, space for everyone, the place was clean , internet worked great. Absolutely no complaints. We'll probably book again next year! Already looking forward to it! There were 20 of us and we all thoroughly enjoyed our stay. The house provided plenty of rooms for privacy, games and conversation. We even managed a sit down dinner both nights. It's just what we needed. The early risers headed to the beach for a walk or run so as not to disturb others. Even with guests playing cards in the parlor the bedrooms were very quiet and enough removed from the noise. A bonus was the weather could have not been any better. We rented this fabulous house with multiple families for our wedding. It was perfect for everyone. The kids loved how big it was! It was big enough and had everything we needed to host a large party after the wedding. It was super cute and very clean. Total Maine charm! The owners and agent were really helpful friendly and very easy to work with. The location is perfect to walk to town and the beach. Even our seniors had no problem. The views from some rooms and the front porch are beautiful. While you are visiting the Candleshop Inn, be sure to visit the Union Bluff for a great meal and a beer at the bar. Also within walking distance is the famous Goldenrod Candy Shop. You can stand on the sidewalk and watch how this historic restaurant makes homemade salt water taffy. Take the kids inside to visit an old fashion penny candy counter, or sit at the soda fountain and have a sundae made with the Goldenrod's homemade ice cream! There are great souvenir shops, choose Mexican, Chinese, wood grilled pizza or fresh seafood from one of the many restaurants located within a quick walk. Many nights a week, stroll over to the gazebo to hear local bands playing in the evening. Of course, there is York Wild Kingdom which features a very nice zoo and rides for the kids. Wrist bands are good for the day so go for the zoo in the afternoon, walk back to the Inn for dinner and head back for rides in the evening. Take a morning or afternoon to head to the Nubble Light House. This is one of the most photographed lighthouses in the country. We are so lucky in York. We have 4 beautiful public beaches to choose from, and if that is not enough, take a quick ride to Ogunquit and enjoy that public beach as well. While you are in Ogunquit, enjoy the shopping and dining there as well. Or make a day of it and jump on board a whale watching boat or deep sea fishing vessel in Perkins Cove. There is so much to do in our area we just can't cover it. Of course, a Maine vacation is all about relaxing so leave yourself plenty of time to sit and enjoy the ocean. Maine really is the way life should be. Linen Service Available: $300 In addition to the weekly or nightly rate, there is an additional charge of $350 for cleaning, $300 for linen rental, 9% tax and a refundable security/damage deposit of $1000. A deposit of 50% of the total due will be required at the time of reservation. Final balance will be due 60 days prior to arrival. If cancellation occurs prior to 60 days, deposits received are non-refundable If cancellation occurs within 60 days, no refunds will be applied. If we are able to rebook the Inn, we refund the deposit less any difference in rates.